This medieval-themed slot, brought to you by us here at NovomaticCasino.co.uk, is something really, really special. Playing this slot will make you feel as if you’re right there in a medieval, royal court where you’re the King, and the Jester is not only your entertainment but is also your best friend. Packed full of special features; high-paying symbols and the chance to win, not one, but two jackpots, this slot is not one to be missed. Step back in time and into the King’s own treasury with this unique and generous, medieval-themed slot. With so many rave reviews and regular, loyal players, it wouldn’t be an overstatement to say that Jester’s Crown is one of the crowning achievements of online casino. In this slot, there are 14 uniquely-designed symbols which offer payouts. The card symbols: 9, 10, Jack, Queen, King and Ace have all been designed with an archaic font; the dice, the archaic instruments (the tabor drum and the rebec) and the medieval characters are all also wonderfully detailed – and together with the evocative music and sound effects, they truly invoke the atmosphere of the middle-ages. With 5 reels and 40 paylines, there are plenty of chances for these symbols to fall in winning combinations on active paylines. Each time you do get a payout, you have the opportunity to gamble it with the double-or-nothing gamble feature. To double your win, all you have to do is click ‘gamble’ whilst the bar light is flashing on – and you can keep on doubling until you get to the top of the gamble pyramid! The highest-paying symbol in Jester’s Crown is the Jester’s Crown itself! The Jester’s Crown is also the Scatter symbol which means it pays anywhere it falls on the reels. If you spin three or more of this coveted crown, you’ll be awarded with free spins! 12 free spins, to be exact. During these free spins, you can win and you can win big – and not only that, you can win more free spins, during your free spins, by spinning another three or more scatter symbols. How’s that for doing diddly-squat? The Jester himself might not be the highest-paying symbol when you spin three, four or five of him but he is the only symbol which gets you to those jackpots at the top of your screen! There are two different Jester symbols – they both substitute for any symbol except the Scatter; they both wink when they fall on the reels but one of them pays x2! Fill the screen with Jesters and you’ll be taking home the jackpot! During free spins, the x2 Jester shows up, and he shows up in abundance. Any win with this Jester will be multiplied by two, and fill the screen with the x2 Jester and you’ll be taking home the x2 jackpot! Both jackpots are progressive which means that, each and every time you spin, they get bigger and bigger. Just as with most other NovomaticCasino.co.uk slots, you can play for free until you’re ready to start winning real money, and once you’ve got the hang of it, you can click ‘autoplay’ and let the game do its thing for you – without you having to lift a finger. 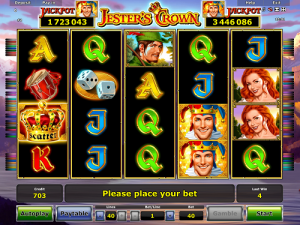 Players of King’s Jester will enjoy this slot game, without a doubt. Aside from slots, NovomaticCasino.co.uk also offers players the chance to win at online table games, such as: Sic Bo, Roulette, Royal Crown 3 Card Brag and Blackjack, as well as live casino games, including: Live Baccarat and Live Poker.